By dpy, September 27, 2009 in Plugins - Publishing ONLY! This plugin writes text into a circle. I got advice to make it better. Thank you , Simon Brown. 10/01/2009 Version 1.0 upload . deleted : option "Rotate text"
added : option "Start position text"
09/27/2009 First post "Circle Text"
1. I don't see the point of the rotate text option, given that it can be easily duplicated by creating text the usual way and rotating it. 2. I suggest placing it in Effects -> Render. 3. Anti-aliasing can be achieved by setting the graphics object's TextRenderingHint to AntiAliasGridFit. 4. Have to considered placing the text rendering code in a try/catch block with an in-place message to stop the plugin crashing with incompatible fonts. Will try this out, thanks! Thank you for many advice. 1. A text becomes dim when I rotate it using "Rotate/Zoom" or "Move tool". "Ratate text" is sharp . 2. I agree. 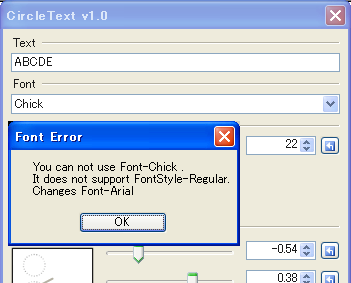 Surely , this is rendering tool than text tool. 3. Thank you. I did not know it. I try it later. 4. I think so , too . and , forgive my poor english. if no problem , All right. Let's decide on this plan for now. 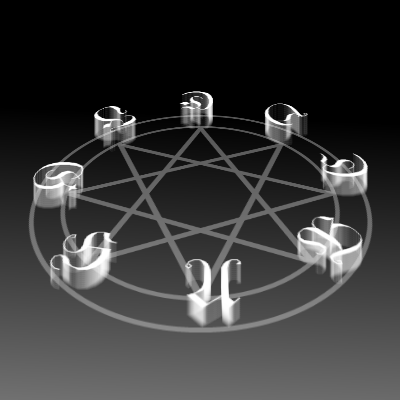 (maybe 2 or 3 day after), I upload new circle text, after debug. I will try this out too looks like it can be quite useful. Thank you very much dpy. nice plugin! this one I've been playing with tonight. It was the start point in the new abstract I just posted. all your plugins are so useful, thankyouu! Thank you for many comment, I'm glad. You taught me about the new possibility of this plug-in. 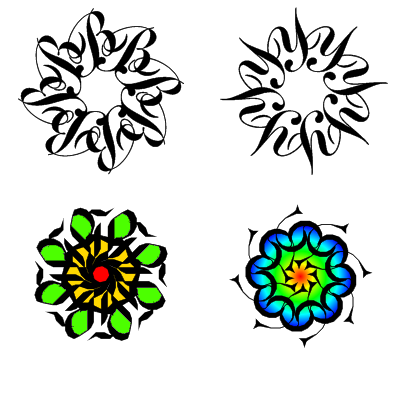 MadJik has a really awesome plugin that generates spirals or "volutes" and his source IS available. It is very interesting suggestion. 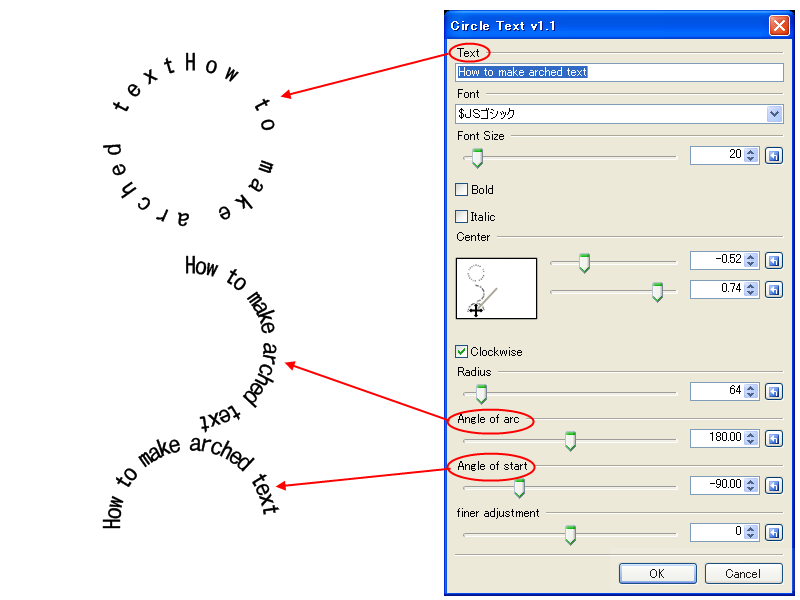 If I create it , it will be another plugin , not option of "circle text" . But sorry , I am not an excellent programmer like Madjik. However , it is possible to render one words repeatedly　for the simple spiral. Separate text by 1 character , like "circle text"? and render spiral? I do not know whether I can write a code for it. I will develop it , if you are OK that this is only repeatedly plugin. And , I will make a new thread , and upload test-version. BTW , I have to update "Circle Text" before it. In your version, is there a way to control the angle of the expansion (the relative space between rings of the spiral)? Also, I see that it always starts displaying characters from the center. A way to control how many initial iterations are ignored would be nice. To be clear, I'd be happy if it was releases "as is". That screenshot looks awesome! I can not understand american joke always , but I could understand your joke! Ok!! Spiral Text Soon coming ! Holy poop. Barkbark the PPPPPPyyyyyyPPP looookss soooo cooool!!! This is now one of my favorite plugins ever. 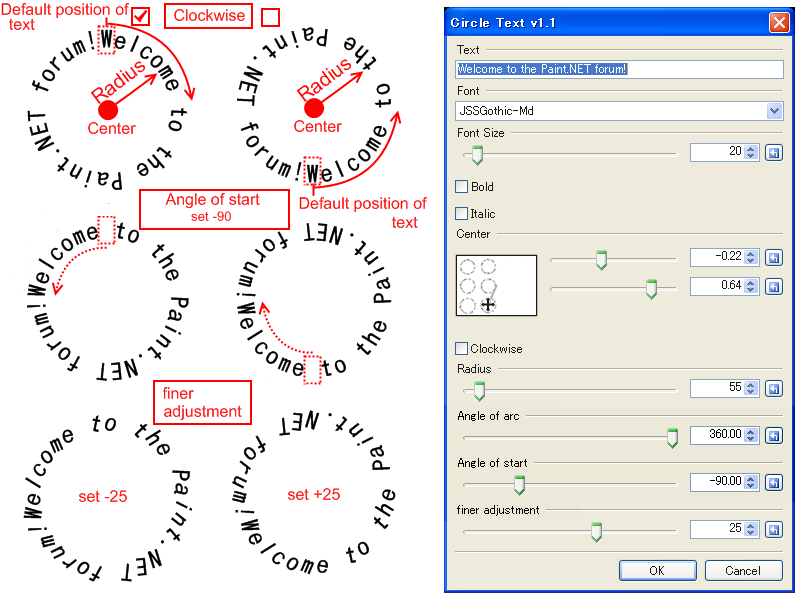 "Spiral Text" in plugin set "Text Formations" has a bug , crashes when the radius is set to '0'. bug fixes ,update,"Spiral Text v1.1". I have downloaded many of the plug-ins located here and they are very good. This one seems like it will be fun to play with but I cannot seem to get it to download correctly. Unlike the other .dll's this one makes a folder within the "effects" folder and I cannot find it when I open Paint.NET and look under effects. Anybody wanna tell me what kind of brainiac mess I have made or how to get this working? Move the DLL out of the subfolder (and directly into the Effects folder) and it should work. Thank you for help ,Simon Brown. and today , i looked the question about this plugin on "General Discussion & Questions". Post subject: Circle Text fonts spacing weird? I just started using the Circle Text plugin but I am having a hard time making the text evenly spaced. Some of the letters cram up next to others while others leave large spaces. Tried to manually space the letters to adjust them as well as tried different fonts but ran into the same problem. Which fonts work the best for Circle and Spiral text and is there a way to resolve the awkward spacing? Thanks much for any consideration and suggestions of this problem. It is impossible in this version . I did not think well about Proportional Font. Because , I am a Japanese , and Japanese font is almost Monospace Font. The English letter to be included in Japanese font is Monospace Font also. When you　use the small letter,please use Monospace Font. In my PC's English Font , "BatangChe" "Courier New" "DotumChe" "GunsuhChe"
"ISOCTEUR" "Lucida Consle" "MingLiU" "SimSun".